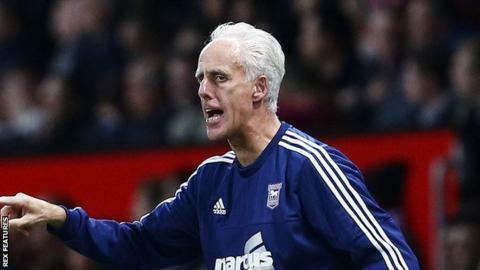 Ipswich Town boss Mick McCarthy says he is not seeing enough loyalty from his side after their poor form in the league continued. McCarthy's side topped the Championship after four games but have since slipped to 12th and are winless in four. "I don't want complacency, we're nearly 25% through the season, there's a lot of games to play but we need to play better," he told BBC Radio Suffolk. "The players who are playing should be busting a gut to stay in the team." McCarthy continued: "I am extremely loyal to players and I think I get that loyalty and hard work back, but that's not happening at the minute." Only Bolton Wanderers (12) have conceded more away goals than Ipswich Town (10) in the Championship this season. Despite keeping just two clean sheets this season, McCarthy is confident in his team's ability, but is willing to make changes after Saturday's 2-0 defeat by Blackburn. "I keep saying I've got the best squad of players I've had since I've been here, so maybe it's time to look at a few others," he said. "We've been 4-4-2 for three years and been as good as anybody but Blackburn were better than us."